Kong scratch card game contains a combination of six symbols that will be revealed if the player scratches off the marked areas. The player wins prizes between $0.10 and $1 million if any of these symbols matches with the prize symbol. The maximum possible winning depends on the prize of the card purchased. If a symbol of a move character gets discovered a cinematic from the King Kong movie will start to be played featuring the respective character. 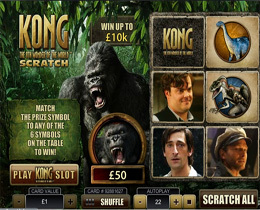 Popular features offered by all other Playtech scratch cards, like auto play and the "scratch all" option. The auto play option allows players to choose a budget and let the software automatically buy cards. The scratch all feature gives players the chance to "scratch off" all hidden areas by just one mouse click. Iron Man 2 is now available in a Scratch Card.